Exact details of what the update will do are a bit sketchy, for sure bug fixes are being rumored. The get the update directly to your phone, on your device go to Options, Advanced Options, Wireless Updates. It will be avialable at 7pm Pacific Time. One of the features that I really like about my Kindle is the ability of the device to save highlighted areas and/or notes about the books you've read. These features mean you can open a book you're either reading or have finished and find your notes and highlighted passages so that you can use them. It's especially handy for things like business books where you want to go back and revisit certain parts multiple times. Of course, up until now, this required you to have the Kindle handy and that's not always possible. Today I got an e-mail from Amazon stating you can now access this information online. Evidently the Kindle is now synching your data with their servers for access anywhere you have an Internet connection. All that is required is to sign in with your Amazon account, and simply select on of your books where you have added highlights or notes. As the Kindle moves more toward being a repository for reference books, this will become even more important. The new Palm Pre is coming, and many are salivating at the mere idea of getting their hands on one. 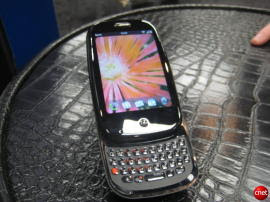 A slide-out true qwerty keyboard and a web based OS are only 2 of the things that very well make this a hugely successful product and make Palm a relevant player in the phone/personal electronics arena again. It's difficult to describe how radical the Palm Pre is. The easiest way is to see it. Thank goodness there is a website that is chock full of videos of the phone in use. You can see exactly what it does and then watch while it does it. The Palm Pre Forum has it all! Just click here for all the info. Whether it's in the treatment area, the administrative area, or even your laptop while you travel, it seems there are frequently times when we just don't have enough USB ports built into our computers. You can always buy hubs, but some of them are clunky, don't offer enough extra ports, etc. LaCie has released a very sleek looking hub that looks to me like it would be great for any and all uses whether it's on the road or in the operatory. 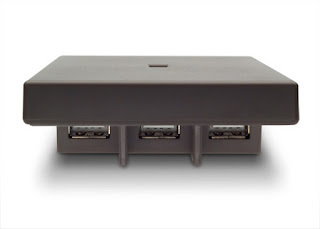 The Core7 hub has 7 USB ports (which is a bunch!) and includes 2 built-in cables. This is obviously great for a laptop as the cables are one more thing you don't have to think about packing. For the operatory, it has the advantage of being discreet with an overhang on the topso that the ports are hidden and it has an an area on the back that works as a hanger so you can attach it to cabinetry or a wall. This keeps it anchored and eliminates the sliding around that annoys me when using a hub in the clinical area. The price is $19.99 and you can find all the information here. While there my schedule and my Internet connection were not always conducive to blogging. I'm back and re-connected now. Thanks to all of the folks in Montreal who were kind of enough to listen my lectures. Thanks also to those who invited me. I had a great time! If you haven't ever visited Montreal, you really should make the trip. It is a beautiful and cosmopolitan city with lots of history and the people are delightful! We're at it again. We're figuring out ways to make your life easier, and we think we have another winner. This time we've created something for the GPS device you already own -- my.Garmin.com is a site where you can manage all there is to manage about your GPS. From registering your Garmin to downloading new maps to learning more about your specific GPS, my.Garmin.com is designed to be a helpful resource 24/7. 3. Connect your GPS to your computer through the USB port. 4. Be prepared to learn more about your GPS than you ever thought possible from one central location. As soon as my.Garmin recognizes that a GPS device is connected to the computer, you can click on the second tab, myDashboard, and you'll see a picture of your devcie along with helpful information about your GPS like map updates and free software updates. myGarmin is completely tailored to you and your GPS, so take some time to explore and discover everything there is to know about your Garmin. MIAMI (May 26, 2009) – Genius (www.geniusnetusa.com), a brand division of KYE Systems Corp., today announced the extension of their racing wheel line with the introduction of the TwinWheel FF, a force feedback gaming wheel developed for race enthusiasts who want a true-to-life experience when taking their turn at the wheel. The TwinWheel FF is a dual platform (PS2 and PC) racing wheel that features 12 programmable buttons for total gaming flexibility and four suction cups and a C-clamp for perfect control and stability during any race – even in those hairpin turns. The ergonomic rubberized wheel with force feedback technology allows users to feel every movement of their vehicle for the ultimate driving experience. The Immersion-patented TouchSense technology allows the user to experience every bump, collision, and crash, as if they were there, live. The streamlined gas and brake pedals let users quickly speed up or stomp on the brakes, just like in real life. Force feedback technology feels just like real life! Priced at $89, the TwinWheel FF is the perfect addition to any racing game. Interested shoppers can go to New Egg.com, Amazon.com, Tiger Direct, Buy.com or other retailers and distributors listed at http://www.geniusnetusa.com/buy.php. Additional information on all of Genius’ racing wheels and other exciting products can be found at www.geniusnetusa.com. A GPS with a 4 inch widescreen for $58.49? Believe it! A special thanks to C-net for this super deal. 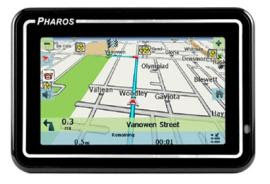 If you are in need for a GPS and you are on a budget, you can get the above pictured Pharos for $58.49. Now this is a pretty stripped down model, but it is widescreen. It does not provide traffic updates, but it does get you where you want to go. And... when you factor in that the device normally costs $149.95, you see what kind of deal you are getting here. Just go here, and enter code when you checkout. 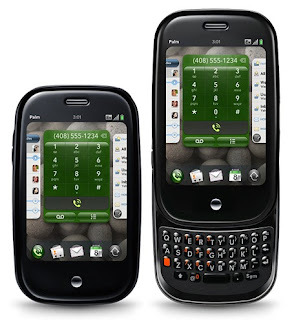 The geek world has been anxiously awaiting the announcement from Sprint on when the new Palm Pre would be available. Well on Tuesday of this week, Sprint finally let the world know that on June 6th, the highly awaited device will be available for purchase. Although many (myself included) had given up on Palm, this new phone with its web OS makes a very interesting play in the mobile phone market. I have a couple of friends who are salivating to get their geeky paws on one the day it can be purchased. I'm pretty sure they'll be standing in line somewhere. The phone will be sold at Sprint stores, online, RadioShack, Wal-Mart, and Best Buy. June 6th is a Saturday so I'm sure they are expecting brisk sales. While I'm a Sprint customer, I've been using the Samsung Instinct since its release last June and have been very happy with it. While it is not an iPHone, it has kept me happy. I'm anxious to see what the new owners say about the Pre. I'm anticipating good things. For the last month I've been able to tinker with the Styla laser from ZAP! The device is an 810 nm diode laser that has 2 watts of power. It is small, approximately the size of a powered toothbrush and extremely easy to use. 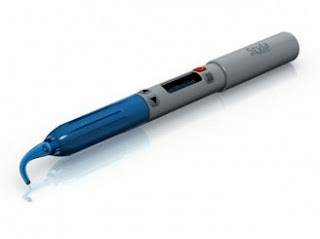 Due to its small size, the Styla can be moved easily anywhere in the treatment area and can be setup within a minute. This lends itself well to be used since there aren't many delays in getting it ready to use. The device is balanced well and is comfortable to grip. This makes it easy to use once you gain access to the target area. It uses a rechargeable lithium ion battery that provides excellent power and is controlled by a wireless footswitch. In order to use the device all you need to do is remove it from the charger, snap on a disposable tip, and place the footpedal on the floor. It is easy to use and provides adequate power for frenectomies, biopsies, cosmetic recontouring, troughing of crown margins, etc. The packaging is very well done and presented. The only drawback is that it is a tad more difficult to use in the far posterior due to the tip size, but that is in no way a deal breaker. If you are in the market for a diode laser, you should include the Styla on your list of devices to evaluate. 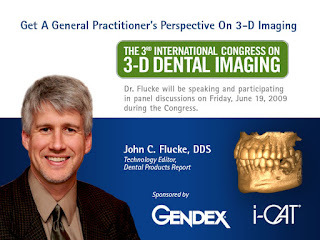 On June 19-20 I'll be in Chicago speaking at the 3rd International Congress on 3-D Imaging. It's a special 2 day event that focuses on the fascinating new subject of cone beam imaging. There are several speakers besides myself and I'm personally excited to be a part of this program as well as getting the chance to learn even more about this exciting new technology. If you own a 3D system, are thinking of purchasing one, or just want to know more about this fascinating subject, you owe it to yourself to be in Chicago in June! For more information and registration info, click here. I'll see you in the Windy City! Every once in a while I stumble upon a product that is so simple and yet so perfect that I'm mad at myself for not thinking of it first. Dotz is a product like that. 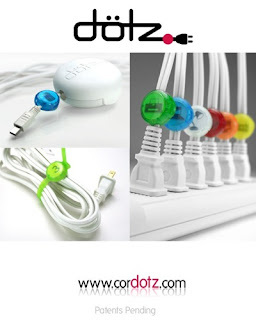 The products attach to cords and cables to identify them with different colors. There are cable straps, wraps, and cord identifiers that can be used either separately or together. For computers in the treatment areas, cords are frequently hidden in cabinetry and hard to identify. Computers in the business area are often a clutter of cords. These products help end the frustration when you need to find out exactly what is plugged into what where. Get it? Good! Now go get Dotz. They are affordable and you can get more info at the website. I had a great trip to Anaheim and the California Dental Association's south meeting. A very big "Thank You!" to all the folks who made the logistics of the trip so easy and to those of you gracious enough to attend my presentations. I really had a super time. I was also thrilled to see the exhibits full of doctors and staff looking and, more importantly, buying on the show floor. I didn't hear attendance numbers, although I did hear speculation that the number of doctors attending this year was down slightly. However, I was impressed with the traffic on the show floor as well as with the attendance at the lectures. From the presenter's standpoint, Saturday afternoon myself and 2 other speakers that I had a chance to chat with had rooms so full that the room captains had to turn people away. Most meetings that I attend usually see an attendance drop on Saturday afternoon. This was not the case in Anaheim. In between meetings and lectures I got a chance to spend some time on the show floor and talk to the vendors. I only spoke with one company that said they were "slightly" disappointed with their sales volume. All of the other companies I spoke with indicated that they had very good sales and I even heard from one company that it was their best CDA South meeting ever. This information was from a pretty good distribution of both large and small firms selling both large capital equipment as well as disposable items, restoratives, etc. My take is that the economic concerns seem to be waning. Several of the companies I spoke with sold very high dollar items and were thrilled with the number of these items sold. The foot traffic on the show floor was very good and in my one on one time with doctors attending they also are feeling that the future is looking brighter than the past. I was talking with my editor at Dental Products Report, Thais Carter and she and I both felt that the show had a great "vibe". There was a definite energy or a "buzz in the air" that was very positive. We even discussed this in a video interview she and I did in the DPR booth that will be posted on the DPR website. My congratulations to the CDA. It was a great meeting! Addent really makes some great products. 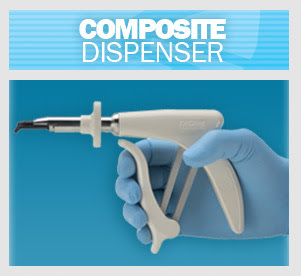 While I was in Anaheim I had a chance to visit with them and to take a look at their new composite dispenser. This is one of those better mousetraps that I come across from time to time. The device is made of high grade plastic that is highly polished. It encompasses a great deal of mechanical advantage making the composite very easy to dispense (even more so if you use the Addent Calset). The device has the easiest loading of any composite gun I have ever seen. Pull the tab back, place the cartridge, and release the tab. 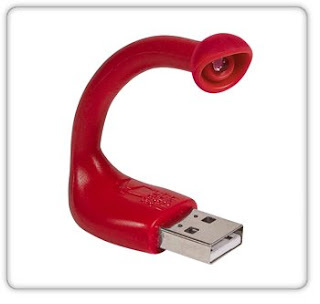 It easily locks and completely holds any compule securely. The device is less than $300 and is highly recommended. I'm anxiously awaiting the delivery of mine! Some of you may have seen the photo I sent of this neat little tray yesterday via Twitpic and Flickr (it's in my Flickr Photostream on the right hand side of this page). This is the Triotray from TrioDent. TrioDent is a New Zealand firm that makes the V3 ring that many of us are now loving to place 2 surface composites. Now they've got another nice "outside the box" kind of product to make the everyday lives of dentists easier. The tray is metal and the small projections on the side help to hold the material in the tray. The best part though is that the projections are individually bendable allowing the tray to accommodate tori, etc. By bending the flanges you can create a custom fit for you patient no matter what their anatomy. For ordering info, click here. A big thanks goes out to my friend Dr. Marty Goldstein and Photomed. Yesterday I got a call from Dental Products Report with a bit of a problem. It seems that one of my articles needed a different photo of me, but it needed to be high res and a certain size. The problem was, I'm at the California Dental Association meeting doing some lectures and there was no chance of me getting a portrait done... except... for Marty Goldstein. My buddy Marty was doing a workshop on dental photography just a couple of doors down from where I was. His lecture was just getting out so I ran in and asked if he could take my picture. Within a couple of minutes the Photomed staff, who were there supporting his workshop, had changed lenses on one of the cameras, found the appropriate flash unit, and had everything ready to go. Presto! A nice photo shot by a great photographer. We loaded the picture onto Marty's Mac, put it on my jump drive, and then I e-mailed it from my Mac via Sprint Wireless Broadband. Marty and the folks at Photomed didn't have to do such a nice thing, but they did and I'm very grateful. I've been using the TF (Twisted Files) from Sybron for over a year now and I absolutely love them. Now Sybron has announced new sizes of these procedure changing files. Great news – TF just got better! Now available in larger apical sizes: 30, 35 and 40. TF is twisted, not ground – unlike other nickel titanium files – making it more durable. Most endodontic files are made by grinding the flutes, weakening the metal’s molecular structure which can lead to separation. Not so with TF. HAUPPAUGE, NY: May 12, 2009— Mydent International has re-launched its rewards program and for a limited time is offering a 1,000 point bonus and double points on purchases. The rewards program allows customers to redeem points earned from product purchases for gifts such as bikes, grills, jewelry, electronics, and much more. The Mydent rewards program awards points for purchases of DEFEND® products. Customers accumulate points as they purchase supplies such as disinfecting, cleaning, and sterilization products; masks, gloves, barriers, impression materials, apparel, eyewear, and basic disposables such as cotton rolls and sponges. They can then redeem the points by choosing from a wide variety of gift items on a comprehensive website. Mydent International, home to Defend® infection control products, disposables, and impression material systems, provides dependable solutions for defensive healthcare. Mydent urges healthcare professionals to: DEFEND. Be smart. Be safe. For more information on Mydent International and its products, call 800-275-0020, or go to www.defend.com. 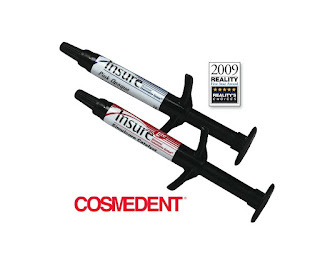 Cosmedent’s Insure recently received Reality’s highest 5-star rating. According to independent evaluators at Reality, Insure’s “choice of viscosities and shades make it the versatility leader along with its long track record.” Evaluators noted that Insure is easy to seat, has almost no rebound, an easy cleanup, and offers dentists the choice between two useful viscosities; Insure Regular and Insure Lite. A new convenient automix syringe is now available in Insure Lite Clear/Simulcure. According to Reality, Insure Automix is convenient, easy to use and handles nicely. Cosmedent’s Insure has been top rated for over 15 years, and continues to be rated #1 in independent evaluations. To purchase Insure or to receive more information please call a Cosmedent’s customer care representative toll-free at 800-621-6729 or visit www.cosmedent.com. If you have even been in a situation where you needed to see your keyboard, but were unable to due to lack of light, this is the gadget for you. In my pre-Mac days (my MacBook Pro has a lighted keyboard) there were times on planes at night where I didn't want to turn on the overhead light and wake fellow passengers up. The USB powered Mr. Brightside light points a small LED at your keyboard so that you can still see to get work done. The device seen in the video is the Martin Jetpack. Although technically it's a ducted fan and not a jet, the device does give the user actual flight. At first I was skeptical of this as my heros Jamie and Adam on Mythbusters couldn't get a device like this off the ground, but they were using plans from the Internet and off the shelf parts. This one is made by professionals. The device is reportedly easy to fly with a joystick and may not require a pilot's license although I'm not sure about either of these claims. One of the coolest features for those of you who love adrenaline, is the safety parachute the device can deploy. From the website: "Production versions of the Jetpack are equipped with a Ballistic Parachute system from Ballistic Recovery Systems. This enables the pilot to be saved from a catastrophic failure down to a reasonably low altitude. Ballistic parachutes can open at very low altitudes, particularly if the aircraft has some forward speed. For this reason the "flight profiles" will be calculated to have the lowest risk possible." The cost is $100,000 and the purchase requires training which is an extra charge (although I cannot find info on how much). However, the training is 5 days and might be as long as 15 days so make sure you've got some vacation time coming. If you are interested, it requires a $10,000 deposit and when your device is about 180 days from delivery, the company will contact you for an additional $50,000. Once the device is ready and you've received the training, you pay the additional balance and the device is shipped to you. So, you risk lovers, this might be the thing for you! I've always had an interest in Garmin. They make great products and, like me, they are located in the Land of Oz. In fact, the world headquarters is about 10 minutes from my home. On Thursday, Garmin announced a new product with some great features. The device is named the Oregon 550 and has 2 nice features that you don't see in GPS devices. The first is a touchscreen and the second is a 3.2 megapixel camera. The touchscreen eliminates the need to push buttons and sort through menus while the camera has the nice feature of geotagging the photos so that the exact location they were taken is part of the photo file. The device should retail for $499 and it's sister unit, the Oregon 550t comes with 100K topo maps in a 3D elevation perspective. OLATHE, Kan.--(BUSINESS WIRE)--Garmin International Inc., a unit of Garmin Ltd. (NASDAQ: GRMN), the global leader in satellite navigation, today announced the Oregon 550 and Oregon 550t touchscreen handheld GPS devices, integrating a 3.2 megapixel digital camera, which creates geotagged images, and a 3-axis compass into the popular series of intuitive touchscreen handhelds. The waterproof Oregon 550’s easy-to-use interface and versatile features make it the ideal solution for customers looking for a multipurpose GPS device. There’s no need to tote a separate camera in your pack or pocket as Oregon 550's 3.2 megapixel autofocus digital camera with 4x digital zoom automatically geotags each photo with the location of where it was taken, allowing you to mark, remember and navigate back to that exact spot in the future. With this waterproof digital camera, you can take and view pictures in landscape or portrait orientation, and 850 MB of internal memory offers ample storage. These pictures can then be printed or stored and shared online, making every trip even more memorable. Once your Oregon 550 is connected via USB, you can use my.Garmin.com to detect Oregon’s photos, simplify the selection and uploading processes and then store those photos on Picasa, a popular online photo sharing community for friends and families around the world. The built-in 3-axis compass and enhanced sunlight-readable touchscreen are two other key additions to the Oregon 550 and Oregon 550t (which features preloaded 100K topo maps for the entire U.S. in state-of-the-art 3D elevation perspective). The 3-axis tilt-compensated electronic compass shows your heading even when you’re standing still, without holding it level. And Oregon’s glove-friendly, color 3-inch touchscreen display is brighter and easier than ever to read and use in all conditions, responsive to the touch of your finger, yet resistant to the forces of nature. Weighing only 6.8 ounces, the Oregon 550 and Oregon 550t come with two precharged AA NiMH batteries. These batteries provide up to 16 hours of life on a single charge and don’t lose energy when not in use. The included battery charger saves you money and reduces waste as batteries get recharged and reused. Also in the box is a carabiner clip and USB cable for high-speed USB connections. A microSD card slot provides even more storage for photos, mapping and memory and allows you to view pictures from other devices with Oregon's picture viewer. Highlighting its versatility, Oregon lets you customize five profiles — automotive, marine, recreation, fitness or geocaching — making the most useful features the easiest to access through shortcuts. That's right, solid ink!! !The device is called the ColorQube 9200 and it uses solid ink. Although, not truly solid when it prints, the ink is placed into the printer in a solid form. Once in the printer, the ink is heated and melted to create a liquid. The liquid is then used in a manner similar to the standard inkjet printers that we are all familiar with. Similar to color inkjets, the ColorQube 9200 uses a block of 3 primary colors and one block of black. Xerox says that each block needs to be replaced after 55,000 which is way more than you can get from standard liquid inkjet cartridges. The ColorQube 9200 is a brand new concept, and like all new tech wonders, it is currently expensive at a cost of $22,000. However, as the concept goes mainstream the price will fall to the point that at sometime in the not too distant future, it will be affordable to most. The device can print between 38 to 85 pages per minute which is amazing for a color printer and Xerox estimates that it will use much less ink than traditional devices. This is definitely a technology that can change the game dramatically. It just needs to reach a price point that is within the reach of the masses. I love it when I get things right! That's probably because it doesn't happen nearly often enough when it comes to technology predictions. However, this one I have to celebrate. Amazon has announced the Kindle DX, a larger screen and larger footprint device to be on the market this summer. It has a 9.7 inch diagonal screen, holds up to 3,500 books, and the screen auto-rotates (like the iPhone and iPod Touch). The price will be $489 which some may find a bit steep, but Amazon knows what the market will bear. The company is currently taking pre-orders. My only complaint is lack of an SD slot. My first generation Kindle has one and I use it to store soothing music so that I can have some nice background tunes to read by. Since Canon has become a major player in the dental photography market, I'm sure there are lots of you who read the blog that are owners of Canon cameras. Of course the what's a camera without lenses, accessories, etc? The good news is that Canon currently has a program that offers rebates on some of their DSLR products. Although not all of these are things that can be used in a dental environment I'm sure you've found (as have I) that once you get a love for a good DSLR, you find yourself wanting to have one at home as well. I personally have a DSLR at the office and another at home. I really wish I could use some of these discounts, but alas I'm a Fuji guy with Nikon lenses. Here is the webpage for the rebates. Since dentistry, even the most high tech dentistry, still requires the dreaded syringe for some procedures, here is one that no patient should be afraid of... unless they have some sort of weird techno-phobia. The pictured syringe actually contains flash memory, not local anesthetic. This USB Syringe Flash drive has 8GB of memory, weighs 11 grams, and is USB 2.0 compliant. Oh, and did I mention it's only $29? This is a nifty gadget that will definitely spur some conversation. Details and ordering info here. Quicken has now announced the ap Quicken Online Mobile for the iPhone. First you need to setup a free Quicken Online account. After creating the account, install the ap to your iPhone or iPod Touch and you can access your account. The ap is password protected and it allows your to view your account balances, credit cards, etc. You can also enter purchases you've made. One nifty feature is that it will also locate nearby ATM's should you need one (although there are lots of ways to do that). This is just one more way that iPhone owners can use the device to manage nearly every aspect of their lives... and personally I'm jealous. Is a larger Kindle on the horizon? Rumors are swirling of the possibility of a larger footprint Kindle device being announced this week. The idea for it seems to be that reading magazines and newspapers is easier on a larger screen since it more adequately mimics the feel and reading experience of the original format. With so many newspapers and magazines suffering now the hope is that publishing them in a format that allows much more cost effective distribution can improve profits. The initial rumor for this device came from the idea of providing textbooks in an e-reader format, but has grown from there. More info from the NY Times. This December we purchased a Roomba for the house and have been enjoying the life of leisure that a vacuuming robot provides. So, if a robot can make your life easier by doing maintenance indoors, why can't a robot help by doing maintenance outdoors? That question is being answered by Husqvarna with their line of automated lawnmowers. The newest addition to the line is the Automower 260 ACX. This automated lawnmower will get a full charge on 40 minutes of AC charging and will run for 60 minutes with the resulting full battery. The idea is to have this automated device mow while you devote your time to other more important tasks. "But," you're asking, "What if there is a problem with it? How will I know?" Well, perhaps the coolest function of this little number is it has the ability to send you a text message to your phone that tells you if it is having problems. More info is available from the Husqvarna Automower website. If you are looking for a hard drive backup solution, here is one that is more affordable than self contained hard drives. This is the Connectland SATA HDD Dock by Brando. The device accepts 3.5" SATA hard drives which simply slide into it. Create your backup and then remove the hard drive and take it home. It will connect via USB or eSATA connections and is Mac as well as PC compatible. The device is only $49.00 and the cost of however many hard drives you will need. Since the device accepts hard drives that are not in enclosures, you can buy them for significantly less money. This helps cut costs when it's time to replace your backup drives. Full details are available at the company website.